The present County of Barrhead has been made up of many local improvement districts and municipalities. Prior to the formation of a local government, the area from Dunstable to Fort Assiniboine was served by two main access roads from the City of Edmonton. The two roads leading out of Edmonton were the Athabasca Trail heading northeast and the Klondike Trail heading northwest -- used by the gold prospectors in 1898. The Klondike Trail Society has worked on mapping and locating some of its historic sites in the County of Barrhead. The Strongheart Historic Site is located on Township Road 610 and Range Road 43. There is a cairn, graves and a trail, as well as the remains of an old cabin. For information regarding this site, contact Ed Graham at 780-584-2211). The Pembina Crossing site is also marked by cairn, and there is trail access to it on Range Road 31A. These old trails can still be seen today, and run through to Woodlands County in the Fort Assiniboine Wildlands Sandhills are near Timeu. For more information on these areas, call the Fort Assiniboine Museum at 780-584-3866. A video of the trail is also available at the County of Barrhead office. The Klondike Trail Society mailing address is Box 384, Fort Assiniboine, AB T0G 1A0. 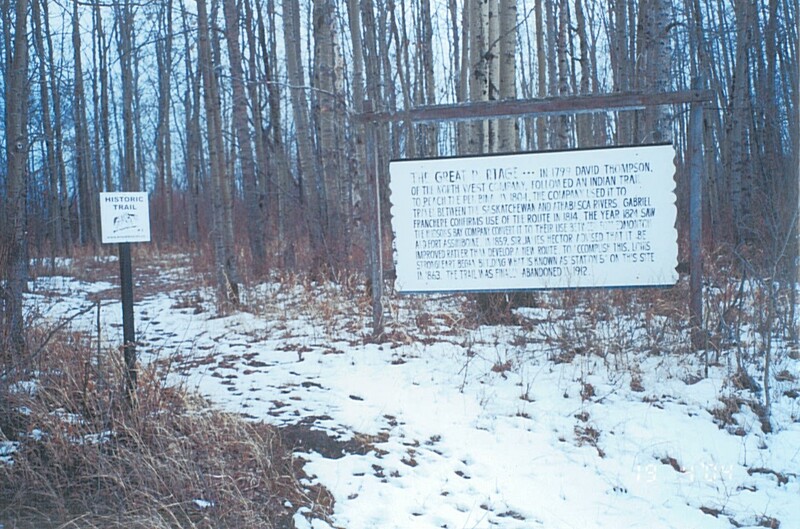 Settlement took place along the main access points created by the Klondike Trail and spread out to remote areas as settlers and farmers moved into the area. The majority of settlers were from Britain and the U.S. 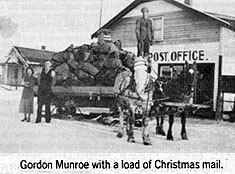 In the early 1900's, the supply hub for the county was the City of Edmonton, eighty miles southeast. As the area developed, supply hubs popped up in Morinville, Sangudo, and Onoway. In 1927, the Northern Alberta Railway built the Pembina Valley Railway to Barrhead. The area was heavily timbered and numerous sawmill operations were established. The county struggled with establishing roads to serve all this industrial activity. The periodic flooding of the Pembina and Paddle Rivers took their toll on local roads and bridges, as they still do today. The demand for better roads led to the formation of the the first Local Improvement District in May 1910. The first elected authority was struck -- ID No. 30-B-5 named the Paddle River LID. The first meeting was held in Gordon McDonald's home at Dunstable. Gordon later became the member of parliament, for the constituency. The newly elected council comprised Markus Basche, Ernie Steinert, C.F. Speck, R.D. Taylor, and Otis Johnson. Mr Basche was elected Reeve and George Koffman was appointed secretary-treasurer at a salary of $225.00 per year. George Schultz was elected reeve. The municipality applied for permission to form a County in 1958 and took over School Division operations. Seven Divisions were formed. The County elected officials and staff have overseen many changes and improvements, from horse pulled graders to the new motor graders costing $200,000, to school buildings costing $10 per sq foot to today's cost of $200.00 per sq. ft. Many people have served the County as councilors. We extend our heartfelt thank you to all these dedicated citizens.